It’s the second day of cookout week, plus, the ladies at Festive Foodies are gearing up for the 4th of July with red, white, & blue colored foods! The two themes merge perfectly! This recipe was actually Spud’s idea! He found the recipe in his High Five magazine and wanted to make it right away! It’s a simple kid friendly recipe, but sometimes those are the best on crazy busy summer nights! To make the taco meat, place the beef and onion in a skillet and cook until the onion is tender and beef is browned. Drain off any grease. Add the garlic and cook until fragrant. Stir in the tomato sauce, chili powder, cumin, and oregano. Cook for 5-8 minutes or until the sauce is thickened. 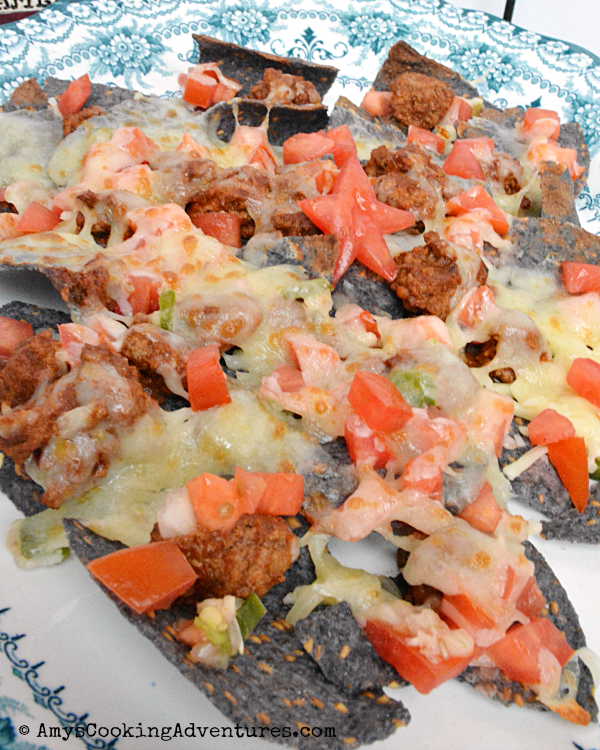 To make the nachos, arrange the chips on a baking sheet. Top with taco meat, pico de gallo, and the cheeses. Broil for 1-2 minutes or until the cheese is melted. To make the taco meat, place the beef and onion in a skillet and cook until the onion is tender and beef is browned. Drain off any grease. Add the garlic and cook until fragrant.Stir in the tomato sauce, chili powder, cumin, and oregano. Cook for 5-8 minutes or until the sauce is thickened. 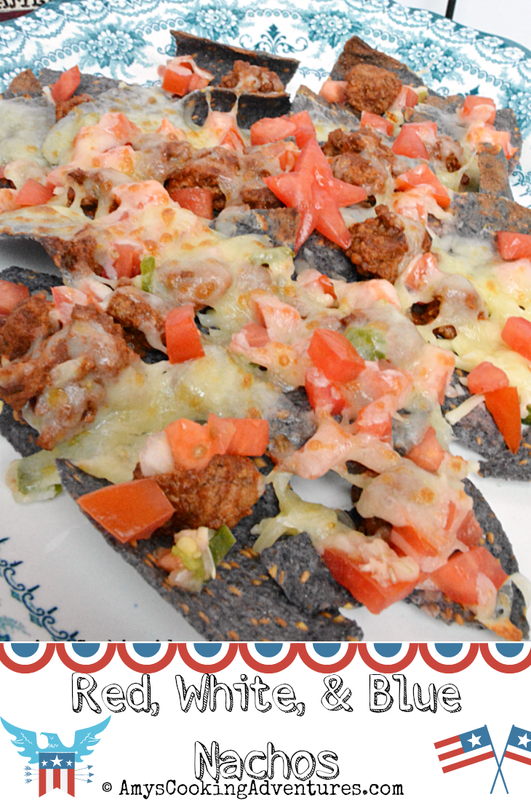 To make the nachos, arrange the chips on a baking sheet. 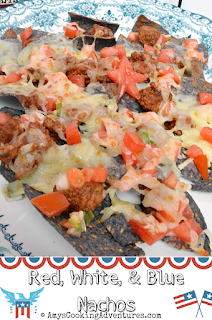 Top with taco meat, pico de gallo, and the cheeses. Broil for 1-2 minutes or until the cheese is melted. Such a great appetizer for any patriotic celebration! Love that it's so kid friendly. I love it when kids get interested in recipes! I love these patriotic nachos. Good job Spud!! 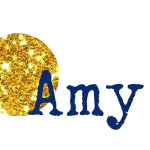 I LOVE this, Amy. I know my boys will love it, too. Thanks for the inspiration. These look so good. 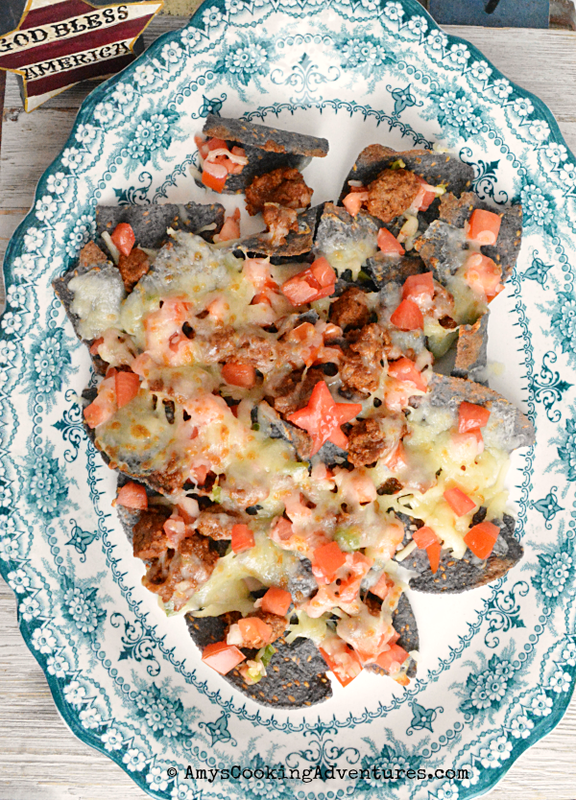 We are fans of nachos and of blue corn chips. I will try your recipe!